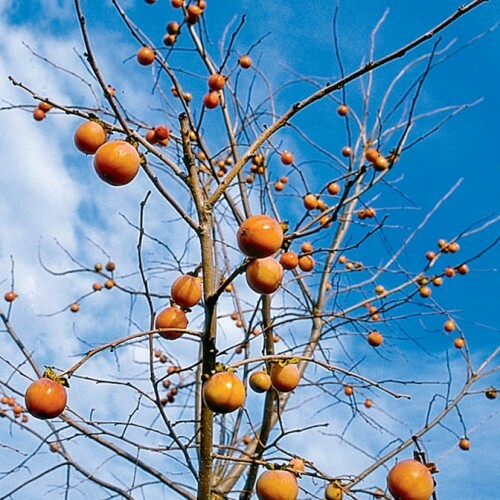 This is the most northern of the seed strains using a mix of 2nd and 3rd generation selections from our seedling persimmon planting of over 400 mature trees in southern Michigan. The trees are easily hardy to -20 F and possibly more. Very easy to propagate from seeds without consumption from rodents, etc. And a great way to make your own selections from this northern form. ECOS-Selections ripening fruit in September and October which always ripen in southern Michigan. These are the earliest ripening forms which are earlier ripening than most grafted forms available today. We stick to these trees which ripen fruit early. Here is how to germinate: Plant outside in the fall 1 inch deep in sandy soil. Full sun is fine. Fairly competitive against grass and can be sown like beans in drills 6 inches apart. Plunk a couple of seeds per hole. Very easy. Seeds sprout late roughly in late May here and they rarely get frost damage. Seedlings are frost resistant as well. For the refrigerator method: Store in the fridge 33-38 F in lightly moist Canadian Peat Moss for 90-120 days, then put at room temperature. Seeds will then start sprouting from 7-30 days. Do not let the seeds dry out in this process. Rarely will they rot in the plastic bag but at the same time do not flood the media with water. Germination is slow but sure with this species and you can direct plant the sprouted ones outside if you want. Rarely will rodents bother them. Male and female on separate trees-50-50 mix of male and female trees grown from seed. Amazingly diverse soils and this plant is quite vigorous in them all. Sand, loam, clay, alkaline or acidic.